Gorge Scrambling, Ghyll Scrambling; Gorge Walking - these are all one and the same. It's big fun from start to finish and can be enjoyed throughout the year. It's the pioneering mountaineers of yesteryear we have to thank for starting things off. They would add interest to their walks to the high mountains by following the ghyll as much as possible, boulder hopping, and maybe a little climbing too. Their aim would have been to stay quite dry, they were heading out for a day in the high mountains after all. Our aim is quite the opposite, to get wet! 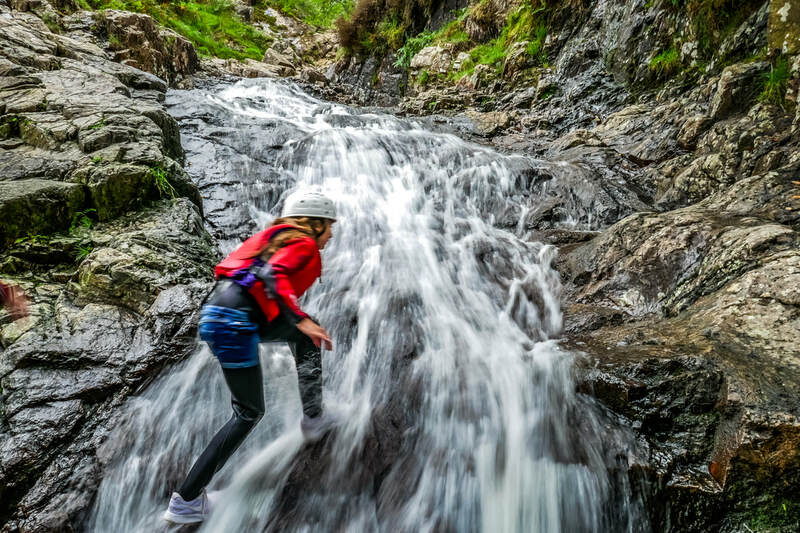 In more recent times, gorge scrambling and canyoning have developed as activities in their own rights, and are amongst the most popular outdoor activity enjoyed in The Lake District. What is it? Scrambling up waterfalls, jumping into plunge pools, scrambling over rocks, boulder hopping, and so much more. 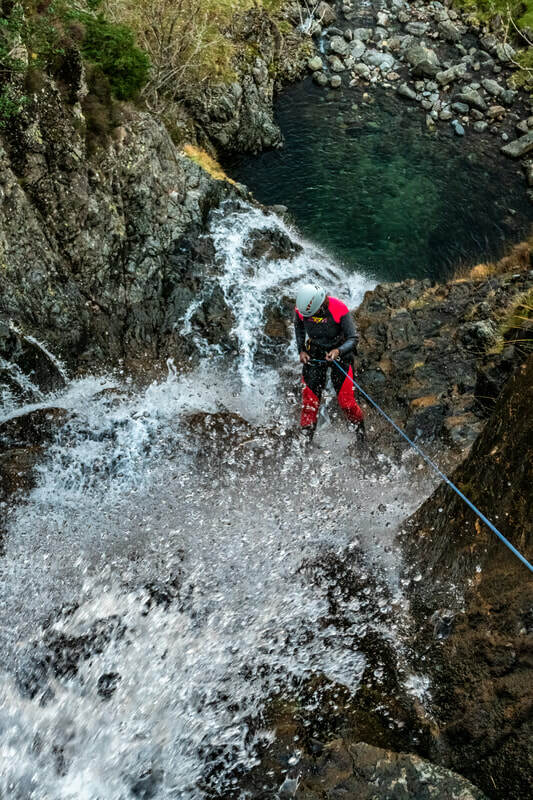 This activity offers a great introduction to the sport of Ghyll scrambling and can be tailored for those with no previous experience or for seasoned scramblers. There is good challenge for everyone and it’s always loads of fun. The Lake District contains some of the most beautiful scenery in England. Hundreds of fells create a vast terrain of rugged mountains. Ghylls can feel like secret places away from busy paths, offering an insight into a different part of Lakeland. If going downstream is more your thing. We can offer Canyoning activities in the amazing Church Beck, Coniston. A canyon descent involves far more jumping into plunge pools, sliding off rocks into the water, and swimming. It's an absolute blast and highly recommended. Stickle ghyll: Our favourite and for good reason. The scenery is superb, the scrambling brilliant and varied, with a range of waterfall climbs and all sorts of challenges to tackle along the way. The setting is open and sunny too, so it's the warmest of the ghylls. With plentiful parking and a family friendly pub at the base this has a lot going for it. In our opinion it's the best introduction to the activity in the Lake District. Tilberthwaite ghyll: When it's been raining a lot, we head to Tilberthwaite as it's wide so carries large volumes of water better and without as much impact on the scrambling activities. During normal conditions this is also a very good place for young children to try Ghyll scrambling. 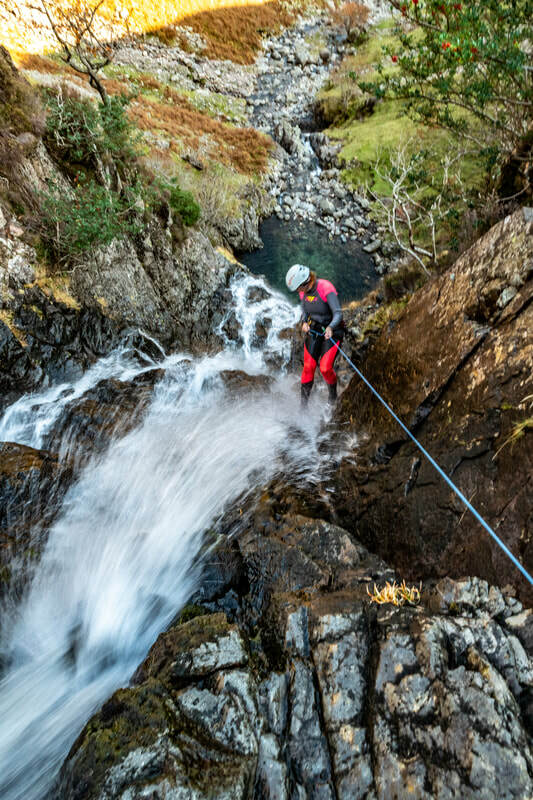 Whorneyside Force: If you're looking for huge waterfalls to abseil through, gorgeous scenery, and crystal clear pools to swim then look no further for you have found your destiny. In the Langdale valley but hidden from view, this experience has a wilderness feel too, but the main event of descending the huge waterfall is sure to give lasting memories. Stoneycroft Ghyll (canyon descent): Another big favourite of ours, this brilliant gorge offers an action packed trip full of slides, waterfalls, and swims. Within easy reach of the Keswick area, this is the place to aim for when visiting the north lakes and in search of water based fun. Equally suitable for adults and children, making this an idea venue for families. Churck beck (canyon descent): So you've tried ghyll scrambling and loved it, because it's amazing right. Now you're looking for more, well this is it. Canyoning in this deep ravine with abseiling, plunge pools, slides, jumps, and swimming in a wilderness setting that offers 'full on' challenge. It's certainly one to remember! Esk gorge (full day out): The ultimate Lakeland gorge without reproach, this is the daddy. A walk of around 45 minutes is needed to access this beautiful place, but the rewards and experience will remain with you forever. Without further ado, the start is a big jump into crystal clear waters and wild swimming at its best. Scrambling takes us upstream and on to many more brilliant jumps into deep and clear pools of pure Lakeland water. As an experience this place is mind blowing. And if that's not enough (what, really) we present Lingcove Beck also, with yet more gorgeous swimming pools. Stannah ghyll: A little known watershed of the mighty Helvellyn range. It feels secret, and keeps on revealing beautiful pools and waterfalls as we ascend. There's much to challenge even the seasoned ghyll scrambler, but it's equally suitable for beginners. Dungeon ghyll: The lower section is a perfect warm up for the nearby Stickle Ghyll. Whilst the upper section is a 'full on' adventure deep into the ravines of Langdale. It's a committing journey, but the rewards are high. This site is a SSSI so we only run this trip occasionally and with small groups or individuals in order that the flora be allowed to flourish. As well as our standard safety equipment, we also provide wetsuits for water based activities. We ask participants to bring waterproof jacket and trousers to wear over the top of these. During very warm weather, just shorts and t-shirt may be enough for comfort, but please check this with prior to arriving.